How retailers are approaching Omnichannel? The new generation of omnichannel retail customers expects shopping anywhere, flexible pick up and easy returns. To deliver the expected seamless and flawless customer experience, retailers require optimized and dynamic inventory and supply chain management with an enterprise- wide real- time inventory visibility. It is nearly impossible to deliver an exceptional customer experience with legacy infrastructure and processes, which support only individual sales channels. Omnichannel Smart Fulfillment Solutions with an efficient cloud based Distributed Order Management system helps retailers overcome the traditional infrastructure and inventory challenges. It connects mobile, online and store channels and aggregates orders from various supply chains and provides a single dashboard of information across various retail channels. Omni-channel Smart Fulfillment helps retailers in maintaining a- single dashboard view of inventory across all the channels, and provides the ability to auto route orders to distribution centers or stores depending on stock location, leverage stock inventory and manage online returns in-store. The smart apps and systems in the intelligent Distributed Order Management system ease up the tasks of store associates to a greater extent. Finding a right partner for your Omni-channel Smart Fulfilment Solution is critical. “Happiest Minds’ focus is to leverage next-gen technologies to deliver digital transformation in your omnichannel retail space. We provide smart technology solutions that bring the customer to store and vice versa. Whether you need help in setting up an entire Omni-channel fulfilment system, or in improving your existing setup, we have the right solution for you. Our technology enables Flexible Fulfilment, Store as Fulfilment Centre, Return Anywhere, and Distributed Order Management so retailers can meet customer needs in a faster and more efficient manner. Our smart technology easily integrates into existing commerce, ERP, POS and WNS systems. Flexible Fulfilment helps customers to do shopping online without the worrying about missed deliveries. Our solution is designed for minimal integration, which means you can have a BOPIS service up & running in less than four weeks. Online and Omni-channel retailers can improve sales and customer loyalty by solving common delivery problems. By implementing a ship from store solution, this ensures your customers get the products they want as soon as possible, and you can minimize markdowns of excess stock. You can use your store as mini-distribution centers. Our solution provides one platform for returns across all your channels, allowing fast processing in-store, refunds & user-friendly process. The customer can buy from anywhere and can return anywhere. 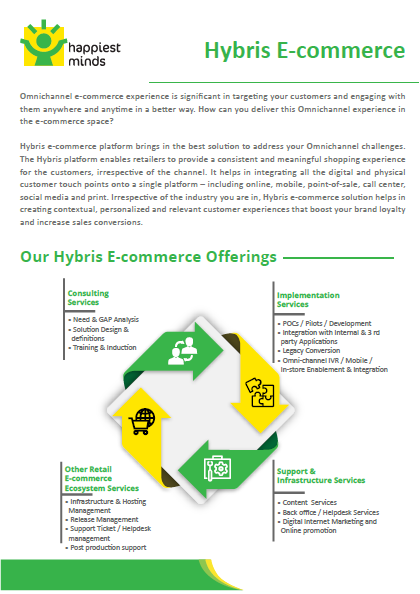 Omnichannel retail assessment and transformation framework from Happiest Minds helps businesses identify and define insightful Omnichannel retail strategies to enhance customer experience.